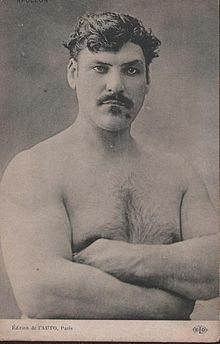 Apollon the Mighty (February 21, 1862 – 18 October 1928), born Louis Uni, was a French strongman, especially famous for his grip strength. Louis Uni was born at eight o'clock in the morning on February 21, 1862 at no. 18 on the boulevard that today bears his name (Boulevard Louis Uni in Marsillargues) in the house his father Jean-Jacques Uni had built in 1845. He was the son of Jacques and Elisabeth (née Brémond) and was descended from a family of locally well-known giants. His grandfather Jacques Uni, born in 1772, was 2.03 m (6 feet and 8 inches) tall, while the average male height in France in 1800 was only 163.7 cm (5 feet and 4.45 inches). Born in Marsillargues, aged 14 years he ran away from his parents' house and joined the traveling Italian circus ‘Caramagne’ at Lunel near his home town. During a performance, the police seized him and returned him to his father. Eventually his parents allowed him to leave home and work with Felix Bernard and Pietro Dalmasso. He also worked with Henri Pechon and August “the Butcher”. He completed his military service aged 20. Also in 1889 Uni competed against Batta (Charles Estienne 1866-1939) in Lille using 118 kilo train-car wheels (with an enormous axle which was much too thick even for the hands of Batta). Batta could only lift it to his shoulders, resting it lightly on his chest for a minute. Apollon was reported to have lifted the weight easily. Part of Uni's stage act was called ‘Escaping Prisoner’, during which he would bend the tempered iron bars of a cage through which he would then pass. He performed this routine at the Folies Bergère, among other venues. In December 1889 he appeared at the Royal Aquarium in London. Apollon's accident while holding back two automobiles in Vichy. In about 1892 he married Josephine, with whom he had a daughter, but the marriage did not last, and after their divorce, she married Castanet, a famous animal trainer. On December 18, 1892 at Theatre de Varietes in Lille in France Uni cleaned and jerked a 155 kilo double barbell, with two weighted globes on each end of the bar. He then found the balance point and neatly slid the barbell onto one hand while lifting one leg at a right angle. Then he let the barbell fall from overhead and caught it in the bend of his arms before placing it on the ground. In 1896 he was standing at about 6'3" and weighing 265 lbs. with 18" forearms and nearly 10" wrists. Besides bending huge thick bars Uni lifted a pair of train wheels that weighed 366 lbs. over his head. In 1913 Uni met with a severe accident during a performance in Vichy in France. When attempting to hold back two motorcars with outstretched hands he cried out in pain and suddenly dropped to the ground, having torn the muscles of his arms and burst a blood vessel. By 1923 he was looking for work as a 'right hand man' and appeared in the silent film Mare Nostrum (1926) cast in the role of “Triton”. By 1928 aged 66 he was still exhibiting his strength in traveling shows. Uni was a friend and protegé of academic and champion of physical education Edmond Desbonnet. He died in Evreux in 1928 aged 66. The French Surrealist poet René Char, being a Southerner and a 1.92 m rugby player, was also an admirer of Louis Uni and addressed to him his famous poem "The Tomb of secrets" in Le Soleil des eaux (Le Tombeau des secrets). ^ Legeard, Emmanuel (2005). La Force. pp. 207–208. ^ Steckel, R. H., & Floud, R. (1997). Health and Welfare during Industrialization (pp. 12-0). University of Chicago Press. ^ René Char, Le Soleil des eaux, J. Matarasso, Paris, 1949.